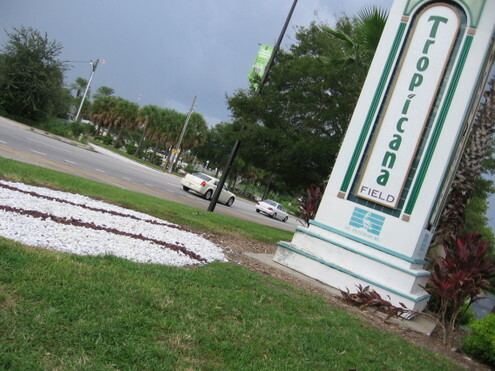 As Florida ever expanding population grows, so does rampant development and urban sprawl. The strip malls, quick marts, gas stations, and Walgreen’s on every corner obliterate the beauty that is the Sunshine state. 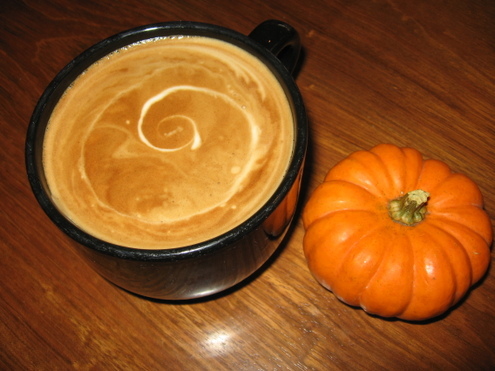 Now that November is here, the weather has become cool, in the 70’s. 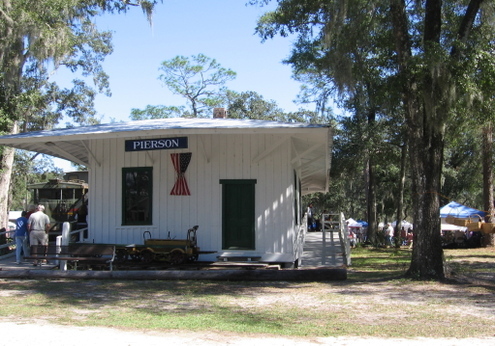 We chose to attend the annual Pioneer Festival that is held in Barberville this past Sunday. 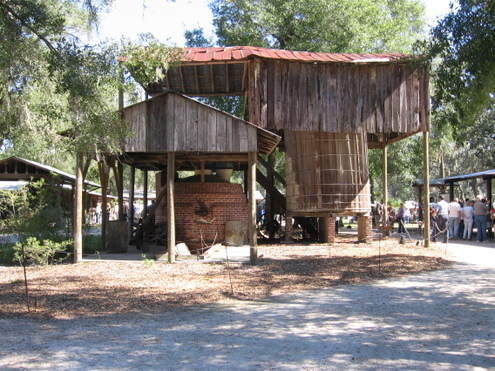 The Fall Country Jamboree, as it is now called (sponsored by National City, of course) takes place at the Pioneer Settlement for the Creative Arts. This organization was established to expose and involve us in the arts of the past. 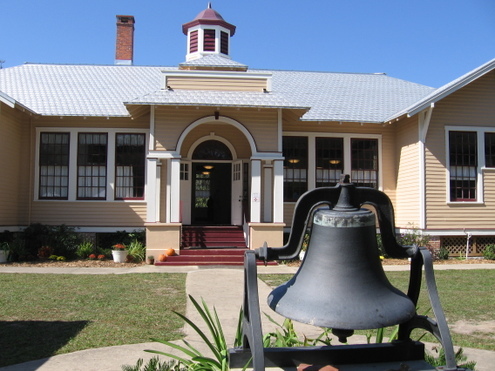 The settlement grew around the Central School building and many more building have been added including a turpentine still, covered bridge and bridge keeper’s house, post office, railroad depot, and many more. 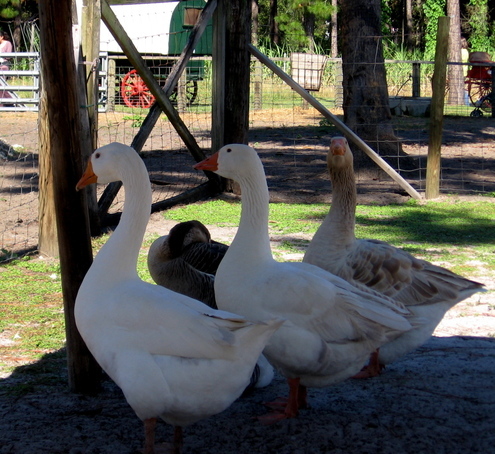 In addition to the many buildings there is a working orange grove, vegetable gardens, and livestock. It’s very impressive. The weather was great, a cool day for a change. Since I had not eaten breakfast, I couldn’t resist the smell of the BBQ and so started the day with pork, beans and slaw. 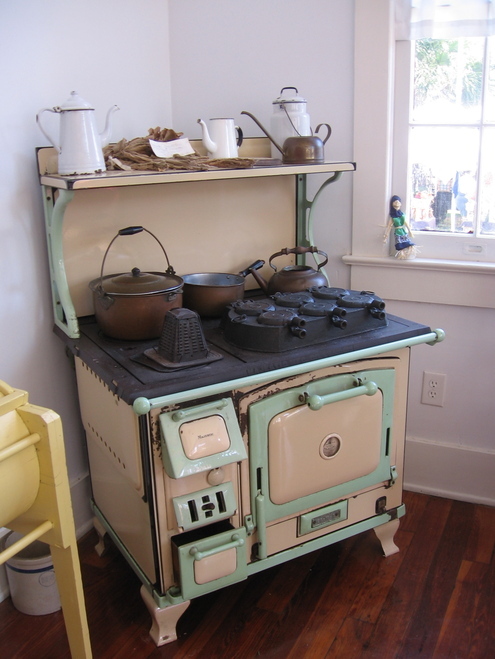 We toured the buildings and were fascinated by all the displays and implements, all of which we were able to touch. Several rooms in the high school house large floor looms and many spinning wheels. 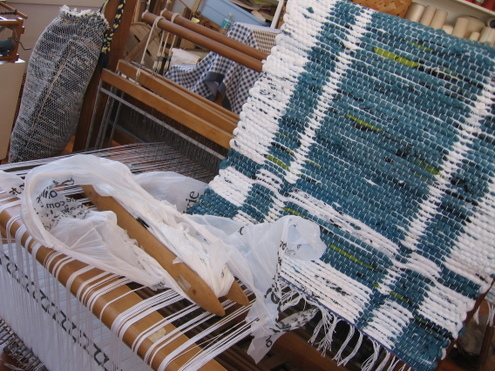 One of the demonstrators was weaving rugs using plastic grocery bags. Her loom was warped with fishing line. You can see the Wal-Mart blue in the pattern. Heading out through the farm area to the old log cabin and found more spinners. Watching a spinning wheel in action always fascinates me. These ladies drew quite an audience, especially the woman plucking the angora right off the rabbit. I cast admiring glances at a rack of hands pun and asked if it was for sale. She was a little hesitant to name a price. I assured her that I could stand the shock. After all I am a knitter and showed her my socks. She laughed and asked if I belonged to Ravelry. Imagine, she recognized my socks. Elayn is a very talented spinner and belongs to a group that demonstrates spinning techniques in the central Florida area. We had a wonderful visit and I was privileged to purchase the skein at the special Ravelry price. The yarn is a delicate 400 yards of beautifully spun silk in all shades of teal and green, lacy, and looking for just the right pattern to be knit into a scarf. The experience added a special touch to my day. There are Ravelers everywhere. It soothed me to see so many people interested in conserving the past through historic preservation, the value land stewardship, and the keeping the home arts alive. 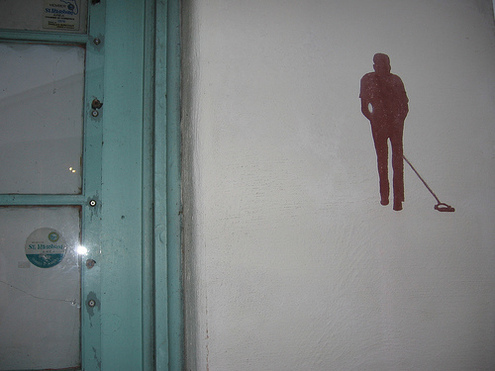 Take time to visit your local arts center where you live. How's that for a public service announcement! Living in the knitting void that is Florida, one is hard pressed to find fiber in forms other than prepackaged skeins from purveyors like Berroco, Plymouth, Coats and Clark, and their ilk. I'm not knocking commercial yarns but there comes a point in your knitting career when you yearn for the basic fiber that has more of that home grown feel. 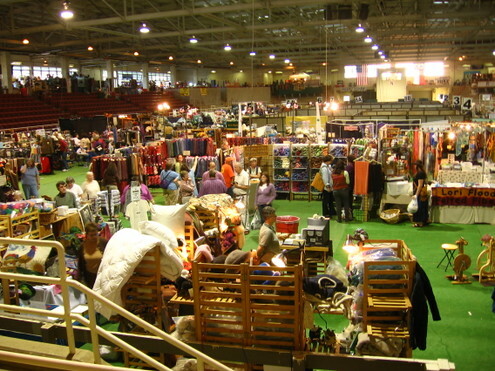 Last year I heard of SAFF, the Southeast Animal Fiber Fair, a three day event in Fletcher, western North Carolina. Unfortunately, last years traveling companion canceled last minute. This year I met with success. Fellow sock knitter Bonnie and I followed the fiber call in our white Mustang convertible and headed for the hills. I won't belabor you with all the wonder that is 5 days away from kith and kin. We had a GREAT time. The weather was perfect, gently cooled. 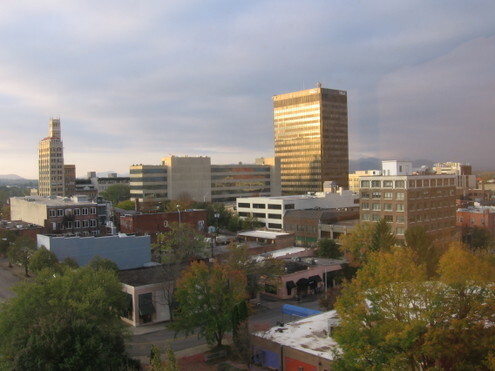 The traffic was smooth, the hotel came with a 10th floor view overlooking Asheville, great beds complete with feather duvets and plenty of elbow room. The restaurants offered up one meal better than the next. The high points were meals at Mela, Bouchon, Corner Kitchen, Mayfels, The Stable Cafe, and the City Bakery. Not a bad meal in the bunch. We hit the fair both on Friday and on Saturday. 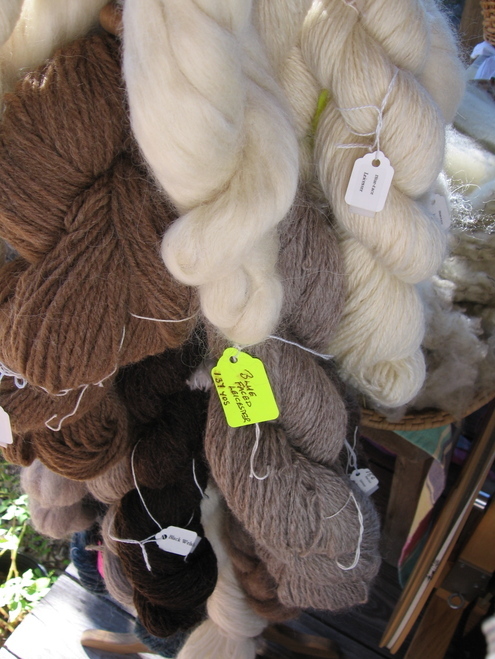 Both of us were overwhelmed with the many choices of fine merino yarns, silks and silk blends, alpaca, angora, in all varieties of yarns and loose fiber. There were spinning wheels in all varieties as well as notions, buttons, swifts, soaps, and the list could go on. 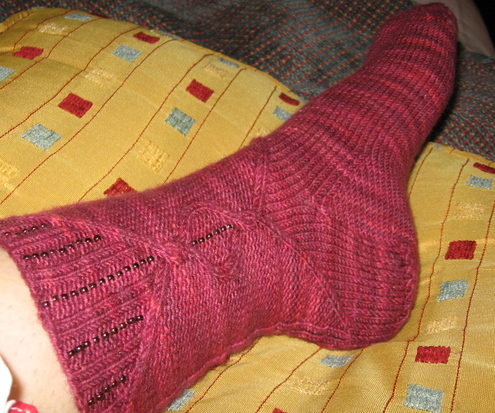 Here is my hotel knitting project, a STR sock, the mate almost complete. 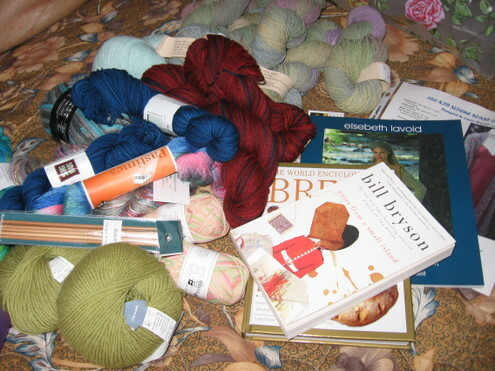 I can't believe that we didn't take photos of our haul but I have uploaded my stash to Ravelry. Our first purchase of the day was soap. That's right, goats milk soap, and plenty of it. This booth offered up over 100 varieties and scents. We cruised both levels and made many passes before we settled. I bought three skeins of silk for a Clapotis, silk sock yarn, merino sock yarn, a new blend of sea wool (more sock yarn), and some lace weight alpaca for a friend. The choices were tough. Included in my purchases were a few patterns from Yarn Paradise in the Biltmore Village. 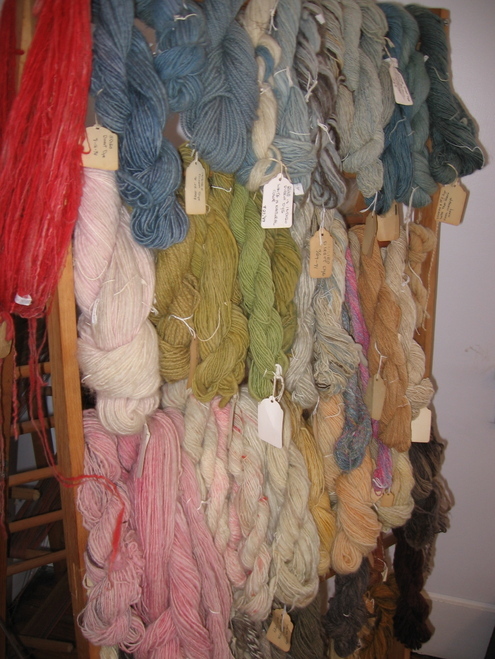 Our trip through Asheville took us to Earth Guild, and we discovered a new shop called Purls. We were bummed to find out that we had missed their knit night on Thursday. 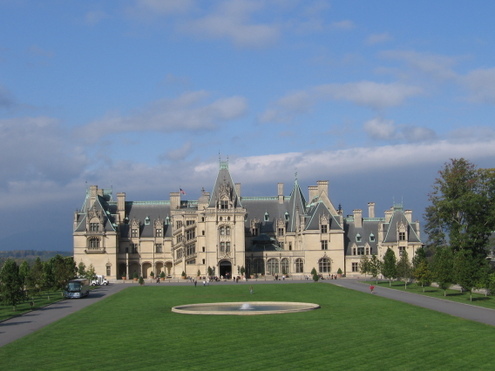 Sunday was spent cruising the back-roads of Asheville and a lengthy visit to the Biltmore Estate. The day ended with frozen custards from Kamm's. We left the cool weather and sunny skies on the Blue Ridge on Monday morning and headed south to cloudy skies and Tropical Storm Noel. Treats were waiting for me when I returned. 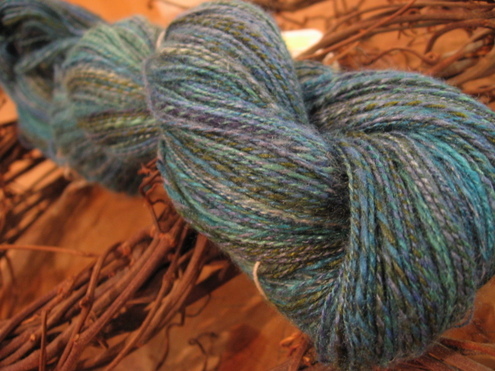 The new STR installment from Blue Moon Fiber Arts, Lenore, the first yarn in the Raven series. Apples new Leopard OS. YEAH! My kind blogging pal, Lunitinks, sent a beautiful counting bracelet made from tigers eyes, glass beads and crystals. Thanks, Secret Squirrel! 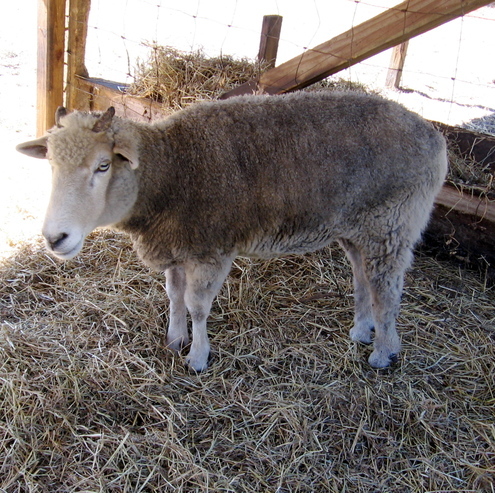 We're committing to a return trip next year armed with knit night information, more time in the Blue Barn with the Ravelry crowd, and prepared to take some SAFF classes, too. Saturday morning was promising hot and humid weather. 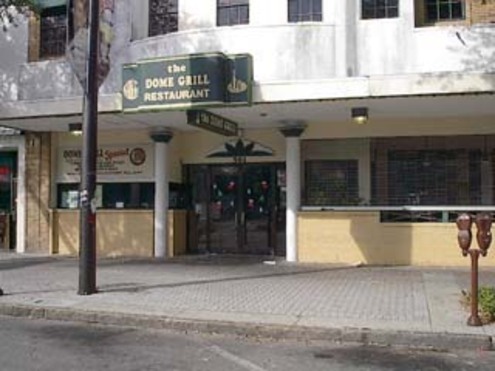 We met Christine at the Dome Grill on Central for a hearty breakfast before heading out for our little yarn crawl. She had mapped out a route that included 5 shops in the area. Our first stop was Needles and Knobs further east on Central. 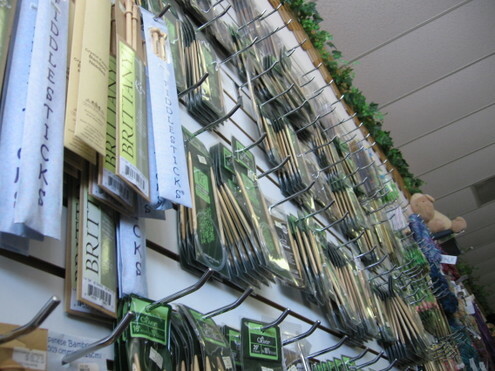 Audrey has an interesting shop that combine yarns, notions and patterns with cabinet hardware. Interesting. The shop offered a wide array of brands that I don't have the opportunity to touch due to my proximity to any yarn shops. On offer yarns from Prism, Tilli Thomas, Cascade, SWTC, Schaefer, Artyarns, Unique Colors, Classic Elite, and a host of others that I can't close my eyes and visualize. Oh, and cabinet knobs. Did I mention that I thought that interesting? As a kitchen designer, it worked for me. I made a Prism purchase to support the local economy. 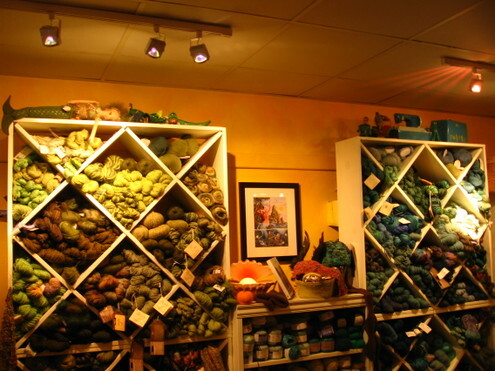 Prism is located in St. Pete and has quite an array of hand dyed luxury yarns. I bought the Kid Slique, enough to knit a scarf. That about ate the contents of my wallet, first stop. Our next stop was Uncommon Threads in Palm Harbor. Wow. 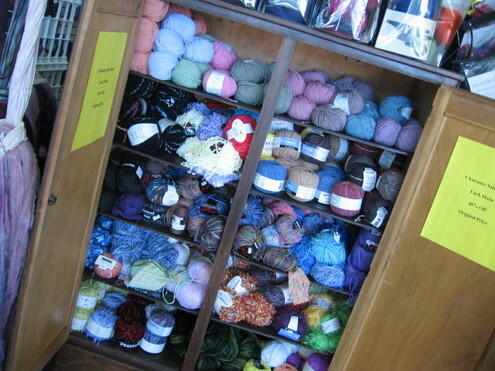 The store was packed with every type of yarn imaginable. 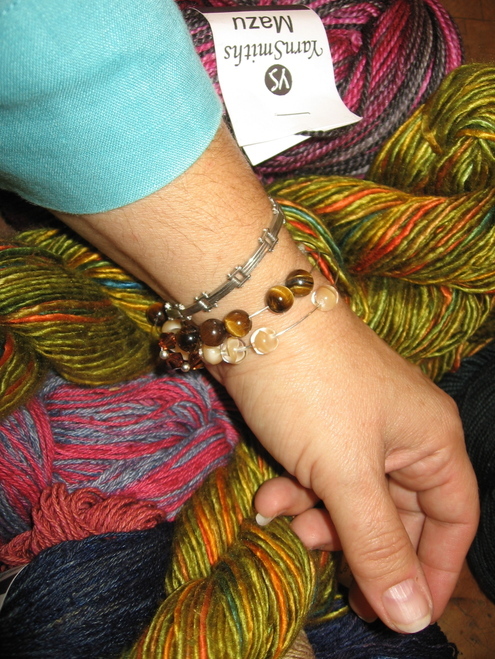 Included were exotic offering like Quivet and Buffalo Gold Sock yarn. There were some sock yarns that I had never seen before, ShiBui Sock and Dream in Color Smooshy. 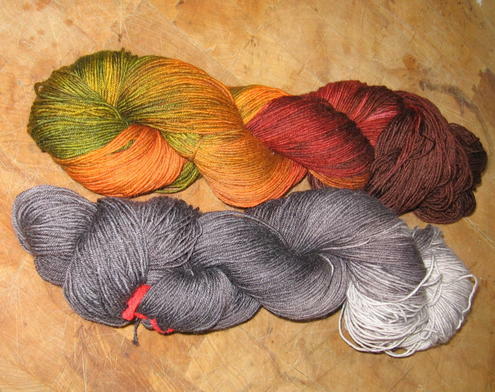 I purchase some Cascade Lana D'Oro for my Red Scarf 2008 and ShiBui Sock yarn. We left Christine at this point and headed back to explore Central Avenue and St. Pete. I had to make a trip into Haslams Book Store and Bonnie was intrigued by the Craftsman House Gallery-Cafe-Studio. Back at the hotel we dumped our spoils and headed to the game. 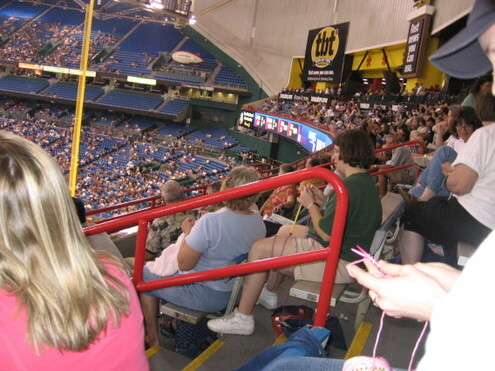 The stands on the party deck were filling up fast with knitters, crocheters, and those few with embroidery hoops. I met quite a few fellow Ravelry peeps and managed to give away most of the buttons. Bonnie and I worked on our socks and watched the Devil Rays tank. At the bottom of the 7th we decided that we endured enough humiliation for one evening and headed back for a little nightcap knitting. Our first fiber trip was a satisfying. We've decided that Stitches East is probably our next weekend away. Look out Baltimore! I still have a few buttons left. Last call before! The closest thing to a fiber weekend has always been a 20 mile drive south for yarn at my local LYS. Just a shopping trip, it rakes a few hours, hardly a retreat. That or my family vacates the house and I stay home and knit. This weekend was my first fiber sleep away. I ended up with a hotel room and tickets (see previous post) to Stitch N' Pitch in St. Petersburg. 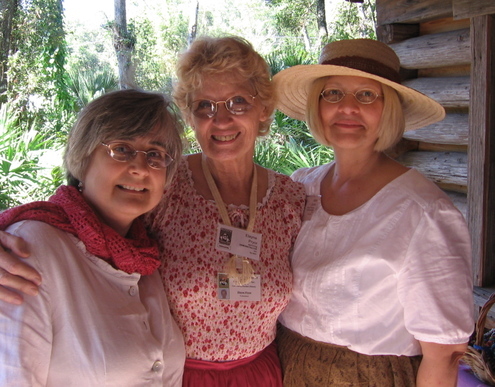 Fortune smiled on my when my friend, Bonnie, accepted the offer of a room, ride, and tickets. Our trip west started out at a leisurely pace Friday morning. 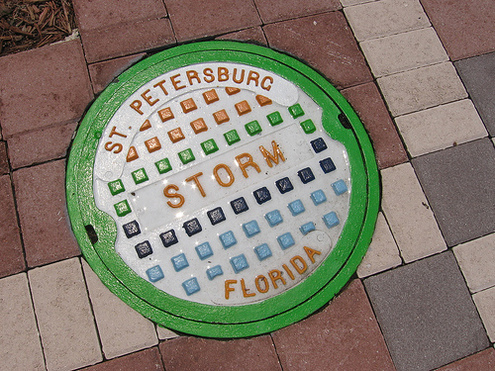 The traffic Gods were good to us and we landed in St. Pete in record time, about a two hour commute. 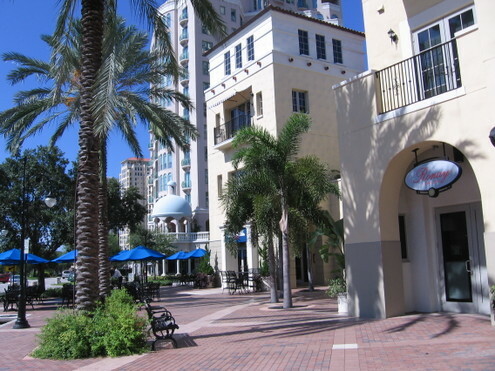 After checking into our room at the Heritage, a renovated 1926 boutique hotel, we set out to explore the Bay Walk area located right behind our hotel. 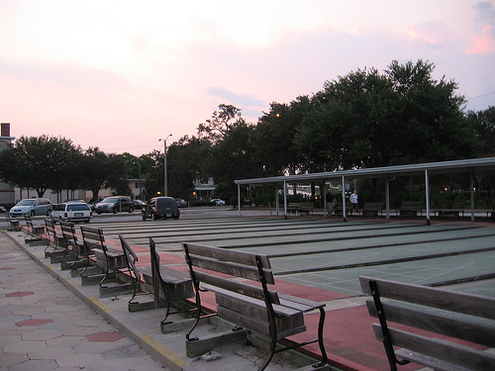 After a leisurely lunch and a stroll or plans were to meet Christine for drinks at a Central Avenue bar with a game of shuffleboard at the historic St Petersburg Shuffle Board Courts. 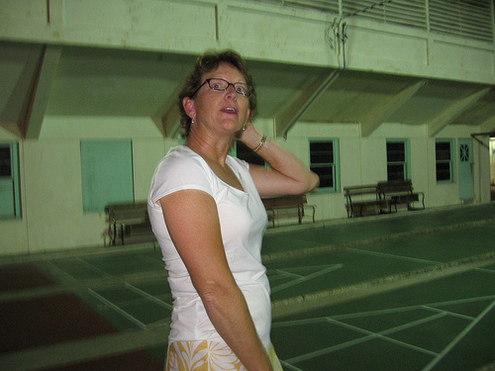 Christine spends her Fridays at the courts, giving short history tours, volunteer sweat equity, and introducing newbies to the game of shuffle board. When we arrived a band was already playing and many of the courts were occupied. 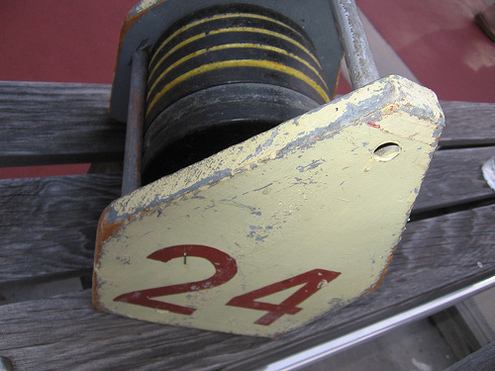 Christine gave us a history of the buildings and the amenities that were offered during the height of the sports popularity. An active imagination could transport you back into a time when one dressed up and stood under the bougainvillea covered arbors, sipped drinks and played a few games prior to attending a dance in later in the evening. The attire is a lot more casual these days and the players a bit more diverse ranging from families with children, young couples, and a few seasoned knitters facing off over black and yellow disks. Tomorrow, day 2, stay tuned. My hopes of visiting all those Atlanta yarn shops were dashed when I realized that the only day we weren’t on a deadline was Sunday. Our trip to Rome requires a break around Macon. So that is where we book a hotel for 2 days, enough to drive Erik to camp then back to Macon for another respite before heading home to Florida. Tom and I managed a stop at Ikea and I can never leave there empty handed. I managed to find a neat yarn storage item in the children’s department. It’s a net that has several compartments, perfect for hanging from a closet rod or depending on your décor, from a hook in the ceiling. I joined “Summer of Stash” and am hoping to put a small knitting dent in the yarns that I have already bought so I suppose that the fact that my timing was off, Atlanta yarn shop wise, was a good thing. Instead of shopping in Macon we rambled through Rose Hill cemetery, a vast terraced parcel of land overlooking the Ocmulgee River . 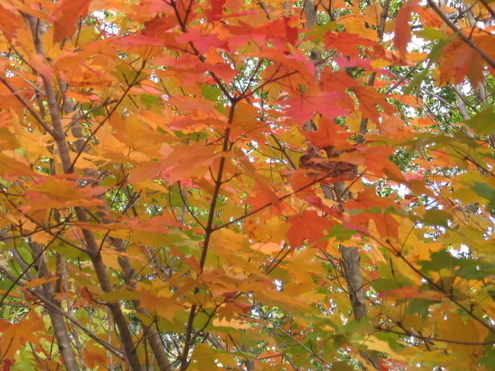 It covers 65 acres and is a fascinating walk that could take you days. 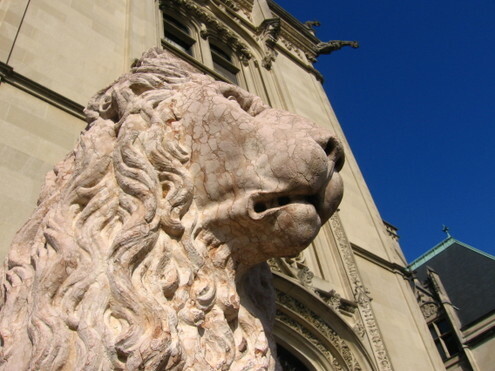 The amount of monuments, mausoleums, and beautiful stone masonry is staggering. On our next visit in mid July will include some of the historical sites that I surely missed this round. My trip was not in knitting vain. I managed to finish my first pair of Jaywalker’s on the trip and will now be casting on for the 6Sox June/July toe up sock. 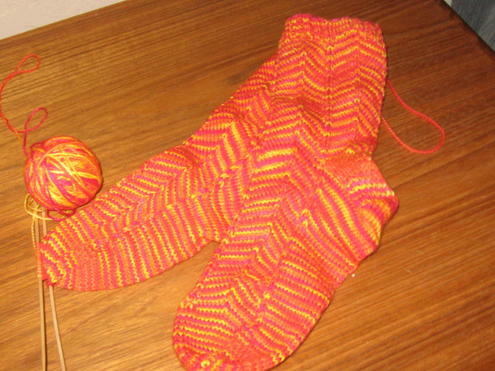 This will be my first time knitting a toe up and I am just a little intimidated by the massive amount of instructions that I downloaded. As for the Jaywalker’s, I can see why they were so popular. Once I figured out the pattern, it was an addictive knit. I particularly enjoyed not have to schlep instructions because they were a breeze to memorize. I just need to stitch up the toe. Thanks Kathy! When we arrived home, the yarn fairy had delivered that last of my May shopping spree, 2 skeins of sock yarn from Furry Yarns in Main. I was tempted by their BOGO sale. The wait was long but I was not disappointed. I also had a small package containing Brittany Birch dpn’s. I broke 2 in one day and had heard that they will replace broken needles free of charge. True to their word, I received not just the 2 but 4 needles in the mail. I swear allegiance to Brittany needles. What great service. I have done a piss poor job of keeping track of the year so far. Erik and I are going to Italy, so I thought this would be a good time to reconnect. We arrived in Milan, Malpensa on Tuesday. The weather was somewhat cloudy, but has since cleared up so that it feels like home. We spent several days in Venice and had a hard time leaving. The city overwhelms. There are so many places to see, one can hardly take it all in. I could easily spend a month or more here. We must have walked 30 miles so far. My feet are swollen and I am taking some time off to refresh.